Family camping tents and car camping tents are the most common types of camping tents most people are looking for. When choosing a family or car camping tent, safety, durability and comfort should be the top considerations. We have researched all the options for camping tents, with value and quality as the highest priorities, and recommend Eureka Copper Canyon Tents as your best option. In addition to our best camping tent pick, we have identified some other camping tents for specific needs. Along with the best family and car camping tents, we have selected pop up camping tent options, large camping tents for big families, . The Eureka Copper Canyon Tent is the best value for camping tents and should be your top pick especially if you’re looking for a car camping tent or family camping tent. The combination of a roomy interior, decent durability and price have made the Copper Canyon one of Eureka’s top selling tents. The Copper Canyon is a three season, free standing, cabin style tent that includes sturdy steel and fiberglass poles, super easy setup, vertical walls for maximum space, and multiple interior pockets for storage. Some other nice features include large screens for ventilation, air flow and viewing. There is a large mesh star gazing window when the rain fly is off with nicer weather. The tent has good privacy for campgrounds with solid walls, window and door panels that can be zipped up for added privacy. A 7 foot peak height allows nearly everyone to walk around the tent without crouching over and the floor area offers a generous footprint. We have identified some big camping tents for family camping. It is important to understand that there are no industry standards for tent sizes. When car camping or family camping, weight is less of an issue and we recommend choosing a tent with space for 2 extra people. If you are camping in 1 tent with a large group or family, these tents are probably a good option. Packed Weight: 54.5 lbs. – 79 lbs. 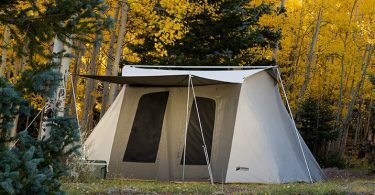 The Kodiak Canvas Flex-Bow Deluxe Tents are some of the best canvas tents for sale and should be your top pick if you’re looking for the best combination of comfort and durability with an easy set-up. There are many campers who swear by canvas tents, and the Kodiak brand is one of the favorites. If weight and pack size aren’t an issue and you take care of your gear, the Kodiak tents will reward you with a tent that will last for years. The tent was designed to provide maximum comfort while being as durable, sturdy and easy to set-up as possible. If you are interested, read our best canvas camping tents article for more canvas tent options. Again, the Kodiak Flex-Bow tents are specifically known for the following: easy enough for 1 person to setup, natural cotton canvas material that stays warm in colder temperatures and cool in warmer temperatures, extreme durability, and good weather performance for most weather conditions. The tent is a stand out for desert or beach camping such as surf trips or Burning Man where blowing wind and sand are no match. Hunters swear by Kodiak tents as base camps during hunting season. When not being used for specific tasks, they make fantastic large camping tents for family camping. 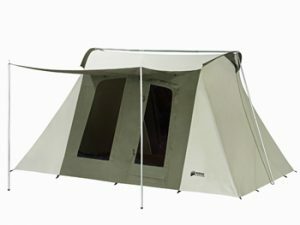 The Flex-Box Deluxe is part of Kodiak Canvas’ Flex-Bow tent lineup. The tent offers a quick, easy, one-person setup that you don’t find often when looking for a canvas tent. The tents feature Hydra-Shield 100% Cotton Duck Canvas which is durable, watertight and breathable. The Flex-Bow keeps a tight pitch with an exceptionally sturdy frame and heavy-duty 12-inch steel rods and stakes. There are two large D-shaped doors located at the front and back of the tent. Four large windows with no-see-um mesh along with two funnel-flow vents help improve air flow and temperature management. Inside the tents are spacious with 6’6″ ceiling height which provides walk-around comfort as well as a customizable gear loft and organizer pockets. The floor is a heavy-duty seamless 16 oz vinyl that is polyester reinforced for added strength and resistance to the elements. Additional features include a large 72×78-inch awning and handy strap-and-cinch storage bag for convenient roll up. The sturdy frame is manufactured from 1-inch galvanized steel tubing while the Flex-Bow Rods are 3/8-inch solid spring steel. Weight: 34 lbs. 12 oz. Center Height: 7 ft. 3 in. The Browning Big Horn 8 Person Tent is a great value for large camping tents and should be a top pick, especially if you’re looking for a car camping or family camping tent. The combination of a roomy interior, decent durability with a great warranty policy, and price have made the Big Horn one of Amazon’s top reviewed big camping tents. The Browning Big Horn is a three season, free standing, cabin style tent that includes fiberglass poles and steel uprights for extra strength, super easy setup, vertical walls for maximum space, multiple interior pockets for storage, and a removable divider for two rooms. Some other nice features include 2 doors and 6 windows for ventilation, air flow and viewing. There is a large mesh star gazing window when the rain fly is off with nicer weather. The tent has good privacy for campgrounds with solid walls, window and door panels that can be zipped up for added privacy. A peak height of over 7 feet allows everyone to walk around the tent without crouching over and 150 square feet of floor area is a generous footprint. 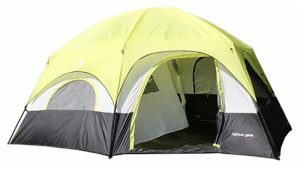 The Ozark Trail 12 Person 3 Room L-Shaped Instant Cabin Tent should be one of your top picks if you’re looking for a very large family camping tent. This is a “L” shaped tent making it more adaptable to most size campsites. The reason we feel it is one of the best big tents for families, is the huge, 3 room design which is great especially if you have older and younger children camping together. The tent is considered an instant tent so setup should be relatively easy. Another great feature is a large awning for a shady spot near the tent. The Coleman Instant Cabin Tent is a great instant camping tent and should be your top pick if you’re looking for an occasional car camping or family camping tent. The tent is a great option for campers who only camp occasionally in nicer weather and are looking for the easiest setup possible in a pop up camping tent. The Coleman Instant Cabin Tent is a three season, free standing, cabin style tent that includes pre-attached poles and multiple interior pockets for storage and touts an instant setup in about 60 seconds. Some other features include rugged, Polyguard 2X™ double-thick fabric which stands up to the rigors of the outdoors. Even though there are vents there are some reports that the tent doesn’t vent well because of this thick fabric and condensation can build up at night, especially when considering the rainfly is integrated. If raining, you’ll need to zip up all the windows and that double-thick fabric really stifles air flow especially on a warm, muggy night. The Black Pine Sports Turbo Tents are an upgraded pop up camping tent and should be a top pick if you’re looking for a car camping or family camping tent with the convenience of instant setup. The tent is a great option for campers who want the easiest setup possible but also want to camp without worrying about the weather. The tent is rated for winds of 50 mph and gusts up to 60 mph. We’ve decide to recommend the best car camping tents that are not as big as large family camping tents. Not everyone who is looking for a car camping tent, needs a big family camping tent. Also, many people who car camping need a smaller tent that can be packed down to save space. You can also find a nice budget car camping tent because you are usually camping next to or near your car. If the weather is extremely bad or the tent does fail, you can head to your car for immediate shelter. The Mountainsmith Tents are a great value as a car camping tent as well as an occasional or entry-level backpacking tent. Many people who are looking for a car camping tent in this price range are also looking for a tent that could be used when backpacking as well. These tents certainly fit that description. The Mountainsmith Tents are three season, freestanding tent that includes 7000 series aluminum alloy poles, side entry doors with decent sized vestibules for gear storage, and multiple interior pockets for storage including a gear loft. With the largest floor areas of any of the car camping and backpacking tents we reviewed, the Mountainsmith Tents are very spacious tents for the weight. Trail Weight: 3 lbs. 6 oz. – 6 lbs. 13 oz. Packed Weight: 3 lbs. 14 oz. – 7 lbs. 7 oz. Floor Area: 20 sq. ft. – 54.5 sq. ft. The Kelty Tents are another great value for car camping tents that can be used as backpacking tents and should be one of your top picks especially if you’re looking for an occasional or entry-level car camping tent. 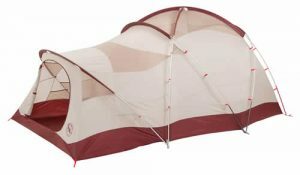 There are lighter options to choose from on our list, but when you combine price with features this tent comes out near the top of our list. The Coleman Sundome Dome Tent is an excellent car camping tent for campers on a budget and should be a top pick especially if you’re looking for an occasional car camping or family camping tent. The tent is a great option for campers who only camp occasionally in nicer weather. The Sundome Dome Tent is a three season, free standing, dome style tent that includes fiberglass poles, and multiple interior pockets for storage. Some other nice features include an E-Port which makes it easy to bring electrical power inside your tent and an included rainfly for extra weather protection. With 2 walls of almost complete mesh, this tent has very good airflow and ventilation and is very suitable for summer camping. However, the rainfly is not a complete cover fly and allows air to blow through which is not very helpful when temperatures drop or in dusty or sandy places. Few, if any, camping tents can match the versatility of the Big Agnes Flying Diamond. This is not your standard camping tent. 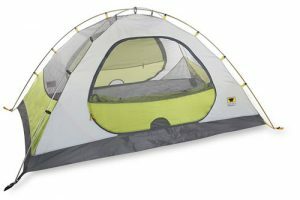 Big Agnes lists this tent as a 3+ Season, Free Standing, Deluxe Car Camping/Base Camp Tent. The Coleman Evanston Screened Dome Tent is one of only a few highly rated tents with a screened porch. The screen room offers an additional room of usable space. This extra tent area can be used for a variety of reasons. If you camp in particularly buggy areas or at times of the year when bugs are an issue, the screened porch allows you to enter the screen room, remove shoes, etc. and then enter your sleeping area inside the tent while blocking out bugs. If you camp with dogs, the screened porch is the perfect place for the dogs to sleep while being protected. The CORE Instant Cabin Tent is a great multi room instant tent and should be one of your top picks if you’re looking for an occasional car camping or family camping tent with easy setup. The tent is a great option for campers who only camp occasionally in nicer weather and are looking for the easiest setup possible. 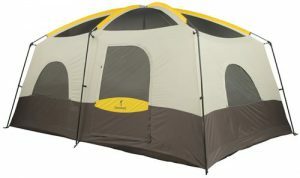 The Tahoe Gear Gateway 12 Person Deluxe Camping Tent is a large, 2 room, cabin style tent with a unique “L” shape making it more adaptable to most size campsites. What we like most about this tent is the size and also the tunnel design. Tunnel tents help withstand wind better and a 12 person tent is pretty much a sail looking to catch air on a windy day. If you are a fair weather camper, looking for lots of space in a tent, this is certainly a good option. This tent has a ton of features that makes spending time outdoors very comfortable. The tent has a divider allowing for 2 rooms, easy-setup poles, stakes, guy ropes, and comes complete with large zip windows and rain fly for unexpected weather. The rain fly includes guy ropes on each side for securing tent in windy weather, and features a solar shield that reflects sun light and keeps tent cooler in warm weather. The ceiling height inside the tent is 7 feet high allowing for head room to move around the tent freely. 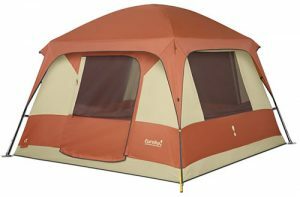 The Tahoe Gear Coronado 12 Person Dome is a great cheap multi room camping tent for campers on a budget and should be a top pick especially if you’re looking for a very large, occasional car camping or family camping tent. The tent is a great option for campers who only camp occasionally in nicer weather. However, the dome shape of this tent will help in case harsher weather rolls in. 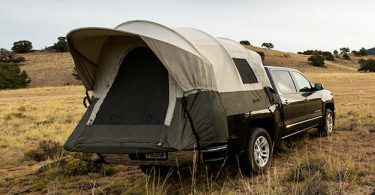 The Tahoe Gear Coronado 12 Person Dome is a spacious, three season tent that includes shock-corded fiberglass poles, and multiple interior pockets for storage. Some other nice features include a 7′ center height making it easier to move inside your tent, two separate living spaces that you can combine by removing the room dividers, and an included rainfly for extra weather protection. 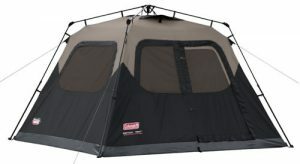 In addition, the tent has a nice mesh roof, a lot of nice sized mesh windows, and doors that allow for good airflow. Value – You can still get quality while saving money and our top pick, the Eureka Copper Canyon Tent, represents value and is a nice combination of good quality, durability, and price. Our other options should be considered based on your specific needs and how much money you are willing to spend to meet those requirements. Durability – Durability goes hand in hand with value and quality. All of our top camping tents are manufactured by companies who stand behind their products. They provide quality camping tents built to last. 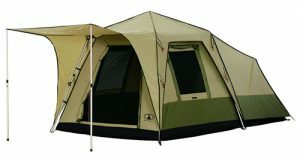 Choosing the right tent to match camping conditions and where you camp are extremely important to the life of the tent. In addition, using proper footprints and understanding that basic tears and holes are easier than ever to repair, will go a long way to extend tent lifespans. Comfort – If you are looking at family camping tents and car camping tents, you are most likely considering camping with your family or a small group. The comfort of your group is going to be important at the end of a long day of activities or if bad weather ruins your day. You might consider getting a tent with an extra 2 person capacity. Also consider the number of vestibules and their size to store all your gear outside of the tent while still being protected from the elements. Airflow and Ventilation – You’ll know it when you wake up inside a poorly ventilated tent. Condensation will collect overnight and you’ll wake up to damp and soggy sleeping bags and clothing. Not a nice way to begin the day. When you exhale while sleeping, your breath is giving off about 1 liter of water. For every other person you are dealing with extra liters of water each night. That water vapor needs to go somewhere otherwise it stays trapped inside the tent and can soak gear. Ventilation is an important aspect of a good quality tent so all of the tents on our list provide excellent ventilation. Airflow is more important when facing hot and humid temperatures. Take note of our indications on how well the tents vent and allow the flow of air. Weather Performance – Many of the 12 person camping tents on our list were designed to perform well in most weather conditions, keeping you safe, dry and warm. They provide protection against rain, wind and blowing dust, provide airflow in hot weather, and will do quite well when night time temperatures get colder. We have made specific note for tents we feel should only be used when the weather is nice.